Can You Make Money with Dropshipping? Today, we’re talking about how to make money dropshipping. I’m going to show you how I’ve made as much as $18,000 in one month with dropshipping, with one product and one website page. That someone else is your supplier, and they usually sell stuff on wholesale. They might have a big shipping warehouse with all kinds of products, and you sell the products for them. Instead of being a major store like Target or Walmart, companies that purchase thousands and thousands of different things and put them in a store, and have people there to sell them, you are setting up your own sales system. The product doesn’t really exist for you until that sale is made, so there’s really no risk until the sale is made. You only pay when you sell a certain item. Now for me, when I made that $18,000 in one month, I was selling gas-powered scooters. You remember those scooters back in the early 2000s that were all the rage? Every kid had to have one. 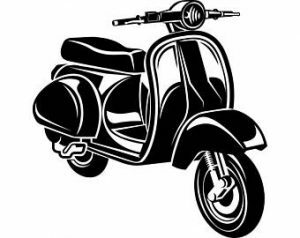 So I set up a simple one-page website selling these scooters. I didn’t have a merchant account for this specific business, so I took PayPal. I had someone come on my site and say they wanted a specific scooter in a specific color. They would buy the scooter, and it would send $379 to my PayPal account instantly. There were some PayPal fees, so I actually ended up getting around $360 or something like that (they take around $30 or something). Then I had $360 sitting in my PayPal, which was great. The problem was that I had to get the scooter to the person. So, I went to this wholesale guy and I sent him $220 through PayPal, and I sent him the address to ship to. The wholesale person would then send the scooter to the guy who bought it. I never even had to touch the product (I actually never even rode a gas-powered scooter until long after I made this website). We made about $360 and lost about $220, so we had about $140 in net profit. We sold $18,000 worth of scooters in December of 2003. Now of course, there was probably about a 40% profit, so that was probably around $8,000 or so in my pocket. So that’s how it works. It’s really easy and really simple. You just set it up, you find some keywords that people are searching for, and you find a product based on the keywords. In this example, I went for the keyword “gas-powered scooters for cheap”. My guess is that it was probably some kids typing that in, “gas-powered scooters for cheap”, and they were looking for scooters for their parents to buy them. The keywords “gas-powered scooters for cheap” was worth $18,000 a month in sales to me. Now, one downside to dropshipping is that you are responsible. So if I’m collecting the $379, and I’m paying the $220 to have it shipped, and this customer wants to do any funny business, I’m on the hook for $379. So, I’m kind of in charge of everything here. If you have $18,000 in scooters out there, and your supplier decides not to ship them, or the shipments are late, that’s on you. The second drawback is customer support. This is something that you have to do. I had to take phone calls on Christmas Eve and Christmas Day of 2003 if there was some delay in shipping, and I had to do a lot of work to get those scooters out. Since then, I retired the site. I sold it to someone and they handle it now, because I didn’t want to deal with all the calls. I could have built a huge business out of it. The guy who dropshipped it was just a guy who had a huge warehouse, and he got these things from China, and he paid like $90 for them, because he got thousands of them. He was making a lot of money with it, and he had a lot of affiliates that help him. I think he’s still in business today. If you’re new, and you just found out about dropshipping, this is something you could do. But I recommend starting with affiliate marketing first and seeing what the traffic wants. The last thing I would want you to do is set up a site and not know if people are going to buy your stuff. We don’t want to do guess marketing. We actually want to know that we can get the rankings, that we can buy traffic, that we could do video marketing or whatever it may be, in order to actually sell this stuff. This can be a good method. You can make a lot of money, and lots of people are doing it. But I would rather see you get started with something a little bit easier, and a little less heavy on the risk. Find your keyword, see what’s out there, and see what makes sense. Don’t jump into dropshipping just because you heard it was cool. Actually search it out for yourself. Find out what you want to sell based on what the demand is, and then figure out what the route is that best suits your needs. There are a lot of different dropshipping methods you can do. My advice would be to build a site based on each individual product. We had a page for the gas scooters, the electric scooters, the different kinds of scooters, and because of that, we were able to rank in the search engines really, really well. And when you find a dropshiping product, make sure that seller is reputable. Make sure they’re not out there just to take your money. You might find out that dropshipping isn’t the best, or you might find out that it is the best for you. There are people that make millions of dollars with dropshipping, and if you work really hard, perhaps you can, too. 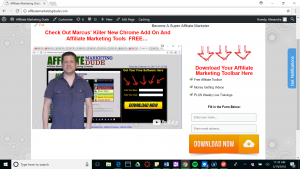 in this video marcus talks about how to make a landing page for affiliate marketing. Clickfunnels Live Demo, Review, And Tutorial – Is Click Funnels Right For Your Business??? Today, we’re going to be talking about landing pages, squeeze pages, and funnels. What are they? What’s the difference? And which one do you need to use to make the most money with your website? First and foremost, let’s talk about landing pages. A landing page is quite simply the page that someone lands on. If you’re taking people from Instagram, or you’re taking people from paid traffic, or you’re doing banner traffic, or you’re sending an email, or whatever, the landing page is simply the page you send them to. It’s usually the first interaction that you have with your audience. 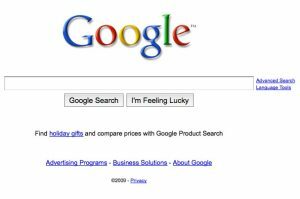 The landing page for Google is Google.com. You go to Google and that’s their landing page. They have a search box on there, because they want you to search. With YouTube, you go to YouTube.com and they have videos on the page. That’s their landing page. Now, you can use this landing page in many different ways. For example, I’ve made millions of dollars with simple one-to-five page landing pages or page sites, where I simply promote affiliate offers. One of my more famous ones was a website for the lottery. The whole idea was to get people to download a toolbar that showed them all the different lottery numbers. I didn’t have to have a mailing list or anything, I simply promoted the product on the page. So in order to get all the confusion out of the way, a squeeze page could be a landing page. The idea of a squeeze page is to “squeeze” your traffic and get the people that are really interested to put their name and email in the box. Another example of a squeeze page could be asking for more information–maybe a free shipping address or something like that. But basically, what you’re doing with your squeeze page is getting people to fill out the form and generate a lead. You see this a lot with Clickbank, with various CPA affiliate offers where the advertiser is simply going through you to make a landing page. The whole idea of the landing page is to kind of pre-sell whatever the offer is. You can also have a landing page which says, “Hey, put your name and email in the box, and you’ll get XYZ.” This would be considered a squeeze page. Again, remember that a landing page and squeeze page are the same thing. A squeeze page can be a landing page, and a landing page could be a squeeze page. The idea is to get as many people on your mailing list as possible, because then you can follow up, market with them, and make a lot of money. I’ve done this in some markets where I’ve generated as many as 500,000 people on my mailing list in about 90 days. I did that with paid traffic, but it was actually kind of cheap because of the fact that I was buying traffic for about two cents a click. You can do this really easily. All you have to do is funnel them over. Right now, we’re running ads on Instagram, and sending people to lead pages, and making all kinds of money. We’re doing pay-per-click ads, Facebook ads, doing all kinds of stuff to our squeeze pages. Because once we get this mailing list, then I could email these people and make a lot of money. Now, let’s go on to the marketing funnel. 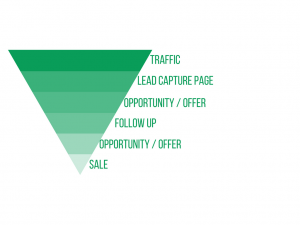 The funnel is designed to get people to funnel through your marketing system. It’s more of a sales process in an integrated way to graduate people through the things that they’re buying. Marketing funnels are extremely powerful when it comes to taking visitors from just cold traffic (like pay-per-click traffic, or video traffic, or something like that) and getting them into your list. You learn what they want, and you bring them into different levels of your paid products and paid services. You graduate them, and you can make a lot of money. Let’s say that your end goal is to sell something that’s like $1,200. In your funnel, you would have stages. You’d start with a landing and squeeze page, and you’d get your traffic to come in at the top of the funnel. You’d have people put their name and email in the box. They would be your leads. Then you would take people from that and go and sell them something cheap, or give them something for free, such as a free E-book with $5 shipping or something. Then you’d get a bunch of people that would get the book, and they would be on your mailing list. After they get the book, you could offer them something for $50 that they would be interested in. A lot of people would take you up on the $50 offer. They would consume the content, and then hopefully later buy your product that is $1,200. For another example, on my site, I have an entire funnel on the back end, designed to get customers to buy different things as they go along in the buying process. I could get people to come to my offer and say, “Hey, check this out. Put your name and email name email, and you’ll get XYZ.” Right now, you could go to www.AffiliateMarketingDude.com, you can put your name and email in the box, and you can get my free internet marketing affiliate toolbar. It’s really cool—5,000 people a month are actively using it. the thing could be just $47 or $297,” or something like that. Of course, the goal is to say, “Well, if you like that, we’re also going to give you a site. Do you want us to build your site for you? That’s $1,200,” or whatever it may be. Right now, we’re testing this on one of my addiction websites, where we talk about alcohol addiction. We want to get visitors to opt-in, then we want them to join a monthly thing, and then of course we want them to graduate through things like personal coaching and other things like that. You see this everywhere, and it’s used everywhere. Remember that all of these things can be kind of the same thing. They’re all examples of landing pages, and they’re all examples of squeeze pages. And if you build them correctly, they can be a marketing funnel for you. You can use all kinds of these things, and you can use variations of them. You have to find out what works for your market. Don’t know where to start – start with finding a niche FIRST, not finding an affiliate offer first. Can’t find profitable niche – many people can’t find profitable niches with little competition, Marcus shows you how in today’s lesson using the Trigger Word method. Be realistic. What would you like to earn yearly from one blog? Monthly? Daily? Marcus discusses how to use a combination of AdSense, affiliate offers, and CPA to make profit from your blog. Watch live as Marcus uses his Trigger Word method to find low-competition profitable niches. When finding a niche be sure to check for competition, cost per click, and monthly searches for your keywords. Find a domain that closely matches your main keyword for your niche. Using WordPress, set up a blog with direct, targeted content about your chosen niche. Add in your affiliate offer(s) and AdSense to start making money on your site. Using your main set of keywords, find the best traffic method for your targeted niche. What do you want them to do most on your site? What does your ad/site promise? Does your site cater to the type of visitor you are trying to reach? Can your visitor find the promise in less than 3 seconds? Is your site focused on what you want your visitor to do most? Do your colors and themes compliment or distract from your message? One of the top reasons that people do not succeed in affiliate marketing is an inability to get started and find the right niche. Live with Marcus, discuss the best ways to find a profitable niche. Paid traffic is a great way to generate leads and sales on your blog. With methods discussed in today’s webinar like monitoring competition, testing, and adjusting, it’s simple to drive traffic and profit while using paid methods. Optimize your blog profit by learning the best techniques to set up your site with a specific group of people in mind. Before you create your blog or website, there are several questions to ask yourself. What is my niche? What kind of people will be searching for this? What kind of offers could I pair with this niche? What do I want people to do on my site? Be direct. When a visitor comes to your site, it should be simple to navigate and understand the purpose for your site. Your visitors time is valuable to them. Keep it short and relevant. Avoid including unnecessary information. Keep it interesting. Boring content will cause your visitors to leave your site. Create content and optimize your blog to keep your niche and your target audience in mind. You want the visitor to complete the action(s) you had in mind when creating your site. Keep your blog design simple in order to keep the visitors’ eyes and attention on the important information. Be personal. If your visitor prefers videos, send them valuable videos. If your visitor prefers PDF files, use PDF’s. Keep the experience personal and provide value. Walk your visitors through the steps you want them to accomplish on your site. Keep the process simple and easily understandable. A good way to interact with visitors is to set up a mailing list and sending out a weekly or monthly newsletter. Be deliberate. Create content with a specific goal in mind and lead visitors to what makes you money. Learn to design your site to make important areas more visually appealing. Sometimes, I don’t feel like doing a damn thing. Do you ever feel like that? You know you need to get stuff done, but you just don’t feel like it. That’s exactly the problem. We’re always waiting to feel something before we act, when in reality, the exact opposite occurs. When we act, we start to feel different. That’s why people get in traps of depression and lack productivity—because they’re waiting for a feeling to overtake them before they start doing something. But if you’re in a rut and you don’t feel like doing anything, or you don’t know what to do, the best thing to do is get started on something. Whether it’s taking a walk, making a video, creating some content, or building a new website, or whatever it is, getting started on something. Because what’s going to happen is this: it’s going to start to change the way your brain reacts. Once we start motion, it creates chemicals in our brain that inspire us to do more things. That’s why I could go weeks without doing anything, but then when I finally do one video, or one piece of content, or one webinar, or one piece of work, then I do more that day than I’ve ever done in the last month. And that’s how it works. You’ve got to get started on something now. You don’t need to jump the whole staircase in one leap and bound like Superman. You just need to get started on one thing and do it now. So you have to ask yourself: what can I get started on right now that will not only change my mindset, but also get me in the direction that I want to go? So stop waiting for a feeling to overtake you before you take action. Take action and the feeling will come.